today we begin red scarf fundraiser time—my favorite moment in the pre holiday ramp up. 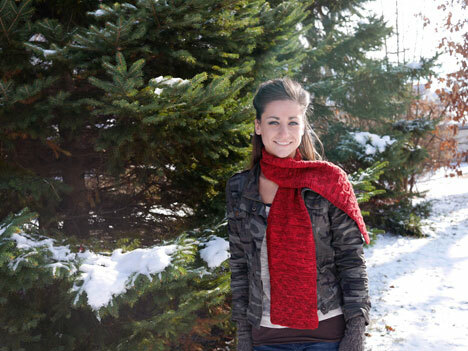 it’s that time of year when we devote december sales from one pattern to raise money for our knitspot scholarship, which goes to one student who participates in foster care 2 success programs. 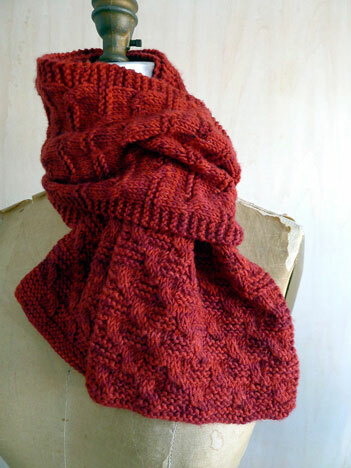 the entire sale price of each 2013 red scarf pattern sold during the month of december is added the knitspot scholarship pot. one of the reasons this is so exciting for me is that during these opportunities, we get to see our knitspot community at its best—when we are GIVING. each year you come out in droves to top what we did last year, showing what you are made of—rock stars through and through. foster care 2 success helps students who are aging out of the foster care system to navigate a continuing education and advancement into independent adulthood. they provide guidance and counseling, classes in life skills, scholarships, and other types of support that a family would normally provide. the 2011 knitspot effort began as a way to raise a little money to send in for the postage fund, but when we tallied the proceeds, we realized we had enough to create a $2500 scholarship. 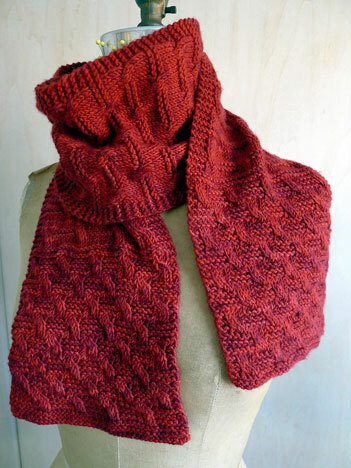 we decided right away that we’d make this a yearly event, featuring dyers who have been ongoing collaborators in knitspot projects (you can see the past red scarf fundraiser patterns here, and here). so far, we have exceeded each previous year’s amount by quite a lot; last year the scholarship grew to $3500; i’m excited to see how we’ll top that this year—as i know we will. soon, we ‘ll publish a very special guest post from brandy, the recipient of our 2012 scholarship (left, above with friend emily; i know you’ve all been dying to finally “meet” her). 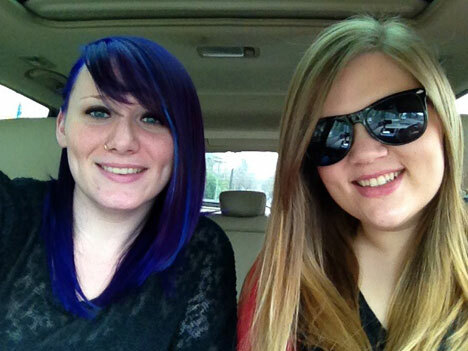 brandy is enrolled in the curatorial studies program at western washington university. she has sent along a beautiful photo essay of her semester at school; i thought it would be a good feature to post with an update on the fundraising in a few day’s time. many of you are aware of the red scarf drive, for which knitters put together care packages that are distributed to students on valentine’s day (the 2013 drive is coming to a close, but if you act quickly, there is still time to send a scarf or help out with postage). speaking of last minute, if you do want (or need!) to knit something fun and quick to give or keep this week, this pattern is your candidate—i gave barb the kent DK yarn for the light-colored one last wednesday, she cast on the next day, and had it all done and blocked by sunday. one of the reasons is the yummi-luscious cable-stitch-and-garter texture; plenty to keep your interest and affection from start to finish, but not so much that it breaks your rhythm. just the right amount to fall in love again with each repeat. hence the name baci—which means “kisses” in italian; doesn’t it look just like a big smooch in that incredible red color?? jill at studio june yarns really outdid herself in coming up with a new colorway. we also have some coordinating pieces in progress in two other of her colorways—coming soon! 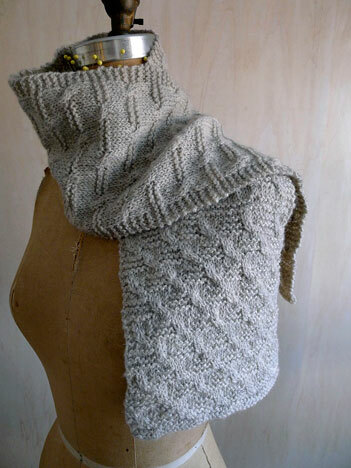 oh, and if all that isn’t enough, did i mention it’s a cowl, too?? our cowl sample is on its way from our test knitter, anne marie and we will show you that in an upcoming post when we have an update on the fundraising (pattern is already done and included with the scarf; i just couldn’t wait another day to release it). speaking of color that we want to roll around in, shown above, the tall scarf in studio june springy sport, a lush, 8-ply superwash merino in colorway red scarf, which you can pre-order in jill’s etsy shop now. she has also dyed up another delicious selection called here comes trouble that i’m knitting up right now into a coordinating hat design. 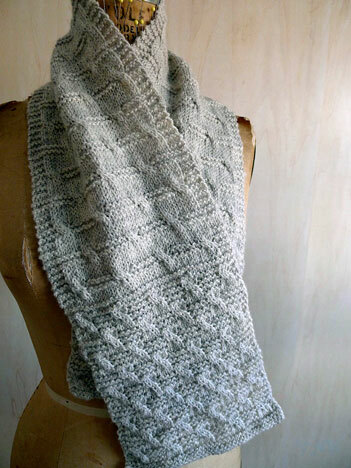 shown below, the petite size scarf in bare naked wools kent DK, in the white sand shade. nicole has just listed a kit for this yarn/pattern combination, available now in our shop. this cabled fabric would also look fab in our ghillie sport/DK or stone soup DK. $10 from the sale of each small kit and $15 from each large kit sale will be added to the scholarship fund. to purchase pattern or view complete pattern information, please click here to visit the knitspot pattern shop. 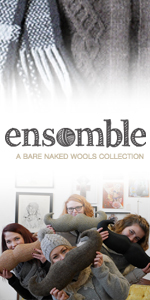 or purchase the pattern in our ravelry pattern shop. 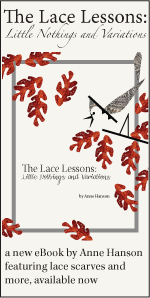 the entire $7 retail price of each pattern sold will be added to the scholarship fund. 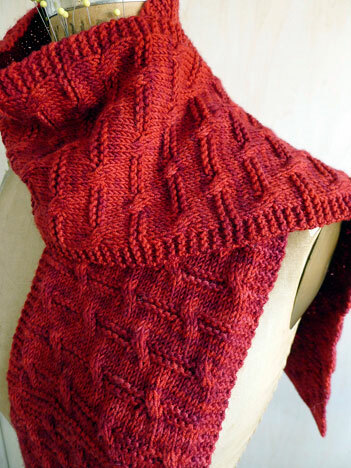 a huge thank you to our collaborator jill june from studio june yarns for her inspirational red colorway and to dear barb and anne marie for providing top-notch knitted samples. as always, it is SO wonderful to collaborate with people i like so much! and of course, many thanks to adorable nicole, a very recent graduate herself, who knows how important it is to be supported and encouraged throughout one’s studies. thank you nicole! ok, now let’s get the ball rolling and make a scholarship happen! This organization is close to my heart. I’ve already bought the pattern! 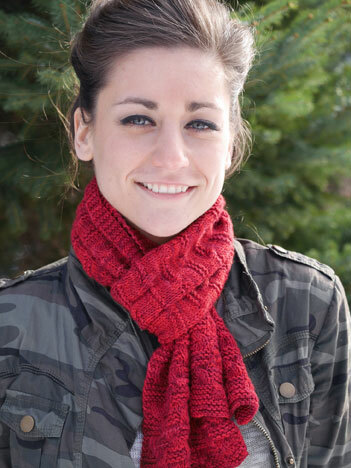 This is your best red scarf pattern yet! Who says we can’t make a Christmas gift for ourselves!? Anne, thanks for your work towards such a great program. Love it! I am such a scarf and cowl ho!! Off to buy! I always look forward to knitting this after the Christmas knitting! And this year a scarf AND a cowl! Woo hoo! So inspirational, and what a great pattern. I am going to make it for Christmas for my “little” sister who is a recent law school grad. The cowl is just what she’s looking for. 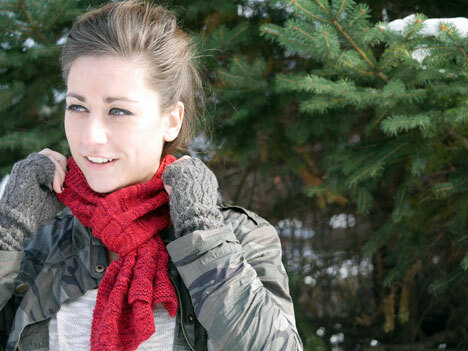 Lovely scarf and such a great cause! As always, I don’t know how you do it all! Love the pics!